Writing about a budget is similar to discussing an emergency fund. Both are underappreciated and can be overlooked. Need proof? Only 39 percent of Americans have enough money to cover a $1,000 expense. What a horrific little factoid this is. To me, budgets and emergency funds kind of go together. If you have an effective budget, you can get the emergency fund built up in no time. But if the budget is out of whack, you are going nowhere in a hurry. And the only emergency will be your 70 year old self still needing to be employed in the workforce. No thanks. I must confess, I have kept a budget spreadsheet for a few years now. I love it! The spreadsheet is nothing fancy. Simply an Excel file that adds up our various monthly expenses and subtracts them from our income. Nice and easy. There was a time, probably a year ago, when I stopped budgeting for a few months. Life went on, our finances didn’t sink. However, I realized I missed it. Mrs. DS would attest that I’m not the most organized person in the world, but I am tidy when it comes to the budget! So why is it important to have a budget? Well…..
1. A budget reveals the overall health of your finances. I pay close attention to the monthly gap between income and expenses. The further the gap widens, the happier I am. A budget makes this so easy to see. 2. A closely watched budget can stop you from keeping up with the Joneses. Thinking about adding a new Mustang for your available third garage stall? Sorry player, the spreadsheet says no dice. 3. Waste is easily identifiable. We all have our own necessities that we need to spend on. But how about the dining out, alcohol, and entertainment portions of the budget???? Or are those the necessities? Hah! 4. A successful budget gives you positive monthly momentum! Few things get me as pumped as seeing a beautifully constructed monthly plan be executed. And then to clear it and start over fresh the next month. Ahhhhh so refreshing! 5. Budgeting helps you achieve goals. Need to know how long until you can afford a Disney Cruise? Maybe you need to put new shingles on the roof. Your budget will be your guide to tell you how long it will take to come up with the cash needed for your goals. Here are some of the main monthly culprits that can cause you to live paycheck to paycheck if you aren’t careful. The Big Hitters– Mortgages, Car Loans, Student Loans, Daycare. Obviously these items will crush your finances faster than most others. Mid Level Money Suckers– Cell Phones, Cable/Dish TV, Insurance, Food/Restaurant. These items may not seem like much compared to the “Big Hitters”, but when added up they can count against you in a big hurry! 1. Live Within Your Means- This is the best financial advice I’ve ever received. The thing is, everyone has different circumstances. Personal finance is indeed personal and unique on an individual basis. Basically, don’t buy a 3,500 square foot house if you can only afford 1,500 square feet. If a Benz is out of your price range, a Ford will do just fine. Be real with yourself. 2. Pay Off Your Loans ASAP- Even if you live within your means, you will most likely have loans at some point in your life. It happens. The good news is, each one that you pay off will help widen the aforementioned gap between income and expenses! And every dollar saved in interest is better in your pocket than in your lender’s. 3. Negotiate Monthly Service Plans- I can’t stress this one enough. Make sure to take advantage of all of the competition each company faces for your business. I routinely call my TV and internet providers to lower the price of service. You may have to do a little homework to find out what the competition offers but it is worth your time. 4. Shop Around For Insurance- You will most likely leave hundreds of dollars on the table if you don’t shop around for insurance periodically. I personally know of people who have stayed with the same carrier for years. When I hear how much extra they are paying for vehicle insurance it blows me away. Loyalty is good, but don’t be taken advantage of because of it. 5. Eat At Home- Dining out often can be a wallet killer. Not only is the food costly, but once you add in some highly marked up adult beverages, the bill escalates quickly! If you can keep this under control, it will do wonders for your bottom line. If you are having trouble coming up with extra money to save or invest, zero in on your budget. Make a simple spreadsheet and track every single expense. It’s super easy to do and you might actually find it fun to analyze like I do! By chiseling away the wasteful spending, you will create a budget masterpiece even Leonardo da Vinci would admire! Good points Tom. I agree that budgeting reveals certain spending patterns. It’s nice to have a history to know what times of the year are more costly than others. Some of that is common sense of course but it is nice to be able to pull up the numbers from months/years ago. I honestly wish I could naturally fall in love with a budget system, but it just doesn’t work for me 100%. We tried it, and I admit that it’s a fantastic thing to follow, but we end up not tracking it closely. We just save and invest, and then spend the rest with care. I admit I think we could be doing better if we had a budget tracker. I’d like to go back to this system (I wouldn’t really mind that much), but my fiance is not on board since he hates budgeting lol… We view it as somewhat micromanaging every little thing, and it sorta makes us go nuts sometimes. He says as long as we’re still able to put away a good amount for our future, grow our overall net worth, and not be strapped for cash, he doesn’t care much for a budget. He said he’s more interested in tracking the net worth and making sure we have enough income to sustain our lifestyle. Despite that, I still think budget is an awesome tool for A LOT of people (especially for the remaining 61% who don’t have enough to cover for a $1,000 expense)! I agree with all the points you mentioned here about why a budget it important. 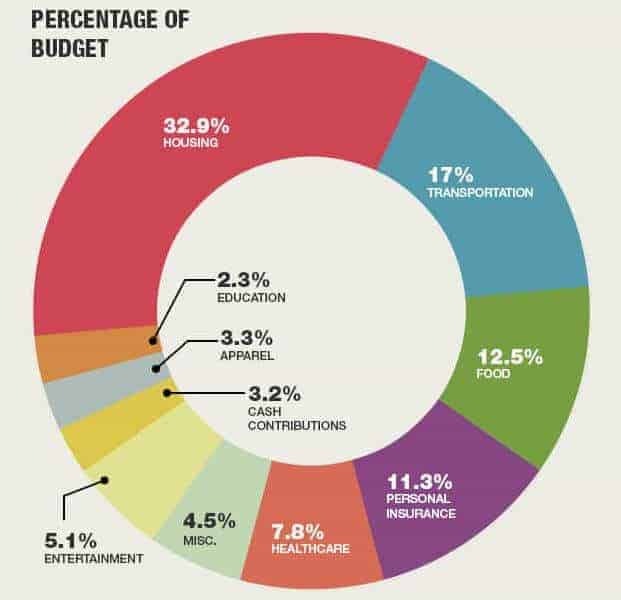 I also think a budget is extremely helpful for those who have no clue about their finances and where their money goes. This is always a good starting point. Now that the markets are a little bit wonky and unpredictable, we psychologically feel like we should be staying home more often to eat, LOL! Hello Ms. Panda! Mrs. DS warned me that you aren’t a fan of budgeting so I have been expecting you! 🙂 In all seriousness, everybody just needs a system that works for them. I like this way but that doesn’t mean everyone will enjoy it. You guys are doing great over there so your system is working just fine! I like to analyze the numbers but I’m not overly micromanaging it. For example, I don’t get wound up if the “dining out” expenses are higher on a given month. A person has to live a little too! I LOVE your pins, good job Mrs. DS (I have a feeling Mr. DS did not design the first pin with the beautiful pink colours). I’m not a big fan of budgeting but it is important to live within your means. I think I do a ‘global’ budget, eg make sure my housing doesn’t eat up too much of my income but other than that I just pay myself and deal with the rest. Thanks for stopping by, GYM! Hello Mr. DS! Really liked the article. What I find interesting is that budget can mean so many different things to different people. Personally, I find it difficult and dislike the idea of apportioning target budgets for different categories and aiming to full within the target number. However, since I am still salaried I have a good idea of the incoming income. What I have done is started to track each and every expense I make on a mobile spend tracker app (after a month-long experiment trying 5 of those apps, detailed on my blog) which then gives me a fair idea on the gap between income and spends. Hello Aparna, thank you for the kind words! I’ll have to check your blog out for your app reviews. I find that very fascinating! The neat thing is everyone has their own ways to handle their personal finances. Exactly why it’s personal. No right or wrong way, unless of course a person isn’t meeting their own goals. I will swing over to check out your site soon. Thanks again for visiting us here! Hi Lily! I fell victim to those Miami cocktails one time on a layover at the airport! The Bloody Marys left my wallet bloody! 🙂 Alcohol markup is crazy, no wonder why there are so many bar/grills! I have been budgeting for the last 3 years (since I started blogging). It has had a remarkable effect. Our savings rate has gone up drastically. We understand where we over indulge. I have also hooked my wife into it. Irrespective of how much you earn … budgets are very useful. Hi DG, thanks for stopping in! Love hearing that budgeting has had a positive impact for you and also that your wife is into it too! When both partners are on the same page it really does make it easier. Agreed! Budgeting is SO necessary. It’s actually a *relaxing* activity now. The blog is getting my heart rate beating faster with all the issues I have had to troubleshoot. I am actually going to go log some numbers now and stay off the blog. Bye! Even when you think you have your finances under control, going thru the budget process can be quite enlightening! I started tracking my grocery spending at a much more detailed level than I used to, what an eye opener. I don’t plan to do it forever but very helpful in the short term. Not only is budgeting good for your financial health, I think it’s also good for your mental health! At least for me it is as I have a constant feeling that we’re overspending. Hey BB! Thanks for dropping in! You make a great point about the mental health. It’s a darn good feeling seeing that things are on track….on time and under budget haha. How about instead of a chisel we use a hammer! haha. Great work as always but especially with how you call out the big hitters. Take your chisel to these first and you will see significant trickle down benefits. Yo Rocky! Hmmm chisel or hammer…..I guess it would depend on how bad the current budget is haha! Some absolutely would need the hammer I’m afraid. Thanks for stopping in as always! We’ve never had a real budget, though I guess me tracking our expenses daily is kind of a daily anti-budget, if you will. Doesn’t matter how you do it, so much as you tell your money where to go instead of figuring out where it went. Hi Angela, yes so many ways to track stuff. Some use software to do it which seems like all the rage these days. I’m a throwback in many ways so the spreadsheets work well for me 🙂 Thanks for stopping in! One day, hopefully it’ll look like Mt. Rushmore haha! Hahahah Steph! You are so funny. 🙂 You will have yourself a chiseled up budget in no time, I am confident in you!